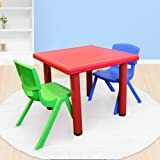 TABLE SET FOR KIDS: The whole package, passed the EN71 Series of Standards, which are harmonized to the European Toy Safety Dirctive, includes 1 table and 2 colourful chairs for primary kids to build their own small but sweet world together; Ideal for outdoor party, kindergarten and kid's room. 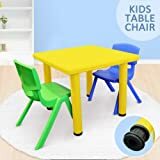 NON-TOXIC MATERIAL: Both table top and chairs are made of non-toxic HDPE plastic, which makes it easy to clean and most importantly, won't do any harm to both your kids and your health, not like the traditional paints which will cause breathing problems, headaches, eye irritation and nausea. 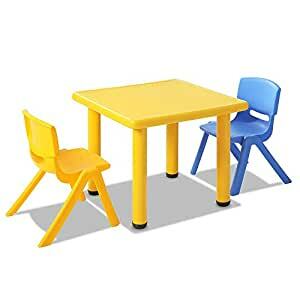 ALL-ROUND PROTECTION: The table is constructed of anti-rust powder-coated steel frame with protected rubber corners for extra sturdy with up to 100kg weight capacity; The chairs are cleverly designed with round and smooth edges and reliable back support with up to 50kg weight capacity; Safety always, no risk or danger to kids in any way. SMART DESIGN: The table feet are 3cm height adjustable for kids to enjoy their activities with right height; The chair is available to stack together for space saving storage. SIZE & WARRANTY: Table overall dimensions: 60 x 60 x 50cm; Chair overall dimensions: 50 x 35 x 27cm; We've got you covered 1-YEAR warranty and provide a customized and professional customer service before and after your purchase; please feel free to contact us if you have any trouble with this item.